Painting with acrylics is rewarding, easy and fun. It’s also affordable, with Discount Art N Craft Warehouse. 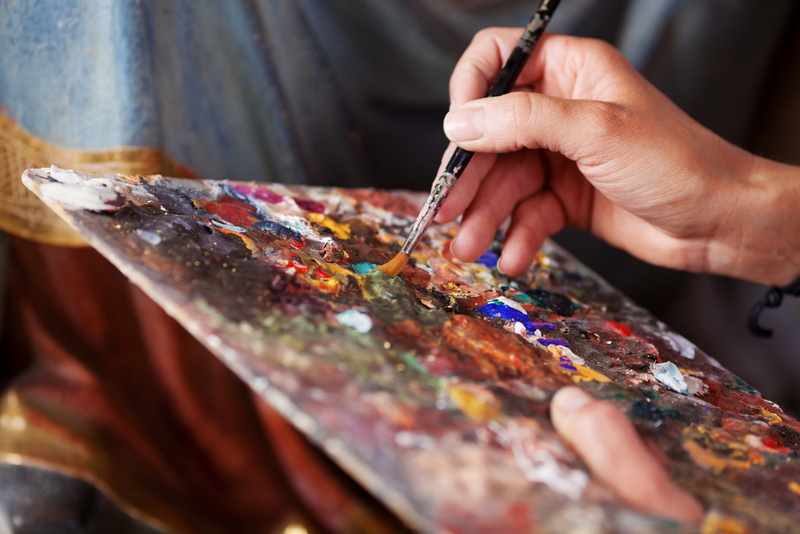 Acrylics can be used in a multitude of ways to create many different styles of art. Getting to know these ways will help ensure you make the most of this particular type of paint. Whether you’re an absolute beginner or have already tried your hand with acrylics, these tips are sure to prove useful on your acrylic painting journey. Glazing with acrylics is a match made in heaven. Not only can glazing improve the life and light of your painting, it can be a great way to save your painting from disaster. Glazing is essentially a very thin mix of colour. It’s achieved by diluting your paint and applying it thinly. The beauty of glazing is that it allows you to alter colour hues in subtle ways. The brightness you can achieve with glazing is second-to-none. You can increase the drama of a graduation of colour, or add a gloss medium to help suspend the grains of pigment above the surface beneath. Complicated or as simple as you like, there are lots of additives you can use to create brilliant, jewel-like glazes with acrylic paints. Want to experiment? Grab some glazing medium, dilute it with a little water, pick up a touch of colour and mix it with the medium. Now brush it over the top of your canvas to see how it alters the colour beneath. Notice the luminosity? Scumbling involves brushing thin or broken layers of paint over another so that some of the paint beneath it is visible. The effect is a broken, speckled or scratchy colour that offers a sense of depth and beautiful colour variation. Scumbling can be done with opaque or semi-opaque colour and with a light colour over a dark. You can also add a bit of titanium white to a colour to lighten it if need be before scumbling. This will help the colour look a little more opaque. Scumbling can be done using a cloth, brush, piece of plastic or even a hammer. The key is to use very little paint. Think of it as using the very last bits of paint from your brush, leaving behind just fragments of colour. Want to experiment? Dip a dry brush into a bit of paint then dab it on a cloth to remove most of the paint. Don’t use your best brush, as you will be scrubbing and pushing hard on it. A cheap, stiff-hair brush will do fine. Work the brush in a circular motion or back and forth. If ‘chucking around’ paint sounds like your idea of fun, have a go at alla prima. It’s quite simple, and chances are you might have already tried it without realising. ‘Alla Prima’ means ‘at once’ and essentially refers to the method of finishing your painting before the paint dries. Every stroke should count, as there will be no retouching later on. Confidence is key, so load your brush with colour and use confident strokes. Start with your biggest brush first and finish with your smallest. Never overwork an area. Want to experiment? Choose a mid-tone coloured canvas such as greyish pink. White tends to be distracting and intimidating and is less forgiving if parts of the canvas show through. Have the colours you want to use ready to go and map out the order starting from dark to light. Reserve the lightest colours until last. As the name suggests, the method of wet on wet refers to working over the surface while the paint beneath is still wet. For example, you might paint a sky and then paint a tree over that sky while the sky colours are still wet. Blending colours this way is easy and forgiving, and results in great texture. To help you along, you can add an additive to extend the drying time. Want to experiment? Firstly, don’t overmix your colours. Sometimes that little bit of Titanium White that didn’t get mixed into the Prussian Blue will create a wonderful effect of light. Secondly, don’t mix your layers. Gently apply one layer of paint over another layer until you get your desired effect. Acrylic paint is ideal for stippling, a technique that uses the ends of the brush bristles to create small spots of colour that create the illusion of texture. The size of the dots and the way they are spaced will give different effects. You can create dark tones by increasing the number of dots in one area, and lighter tones by spreading them out. You can suggest form, shape, depth and contrast. You can also convey light and shadow. Want to experiment? Try using a stipple sponge to create a beard or stubble or textured grazing on skin. Simply apply a small amount of paint and dab away. For an all-purpose brush, choose a synthetic Filbert brush with either a straight or rounded edge. Experiment with a variety of brands to find the paint that best suits you. Acrylic paint can vary greatly depending on the brand. Have a spray bottle of water handy when painting as acrylics dry quickly – sometimes too quickly. Gesso the canvas even if you buy a pre-prepared surface. This will offer you the best surface for your masterpiece and will ensure the longevity of the piece. Paint the largest shapes of your composition first with the largest brush you can. Save the details and smaller brushes for the end. Consider that cheaper acrylic paints have a higher ratio of binder to pigment and that they will dry darker than what they appear when wet. If you get tired of scraping dried paint off your palettes, consider disposable palettes. 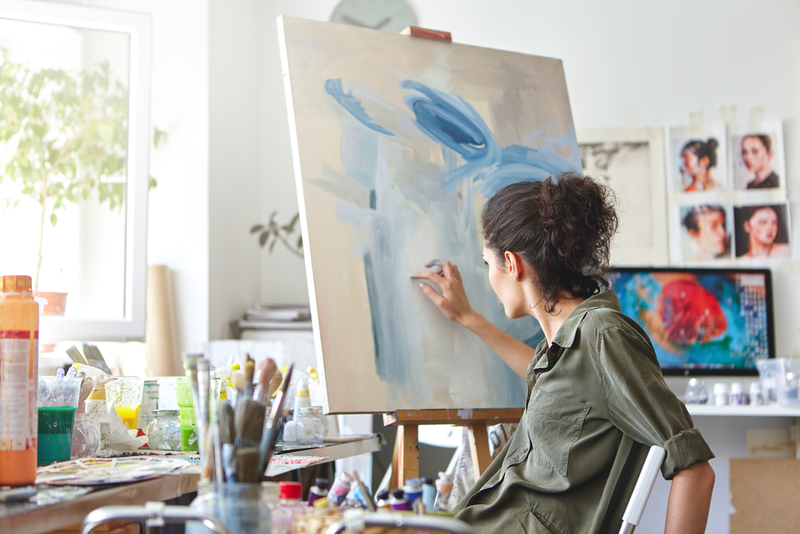 Whether you’re just starting out with acrylic or you’re still finding your feet, there’s no denying that acrylic paint is an excellent medium. It’s forgiving, quick-drying, water-soluble, affordable and versatile. If you’re not happy with something you’ve painted, you can simply let it dry and paint right over it just minutes later. You can also paint on just about any surface, as long as it doesn’t contain wax or oil. For all of your acrylic – or general – painting needs, Discount Art N Craft Warehouse have you covered. Shop online from the comfort of home and receive your items within 3-5 working days.